Bred for no other purpose than to race and win, greyhounds in Australia are literally running for their lives. Greyhound racing begins as a gamble and for most dogs ends in tragedy. Every year in Australia, around 20,000 greyhound pups are bred in the hope of finding a quick runner. But not every dog is suited to racing. And like a lottery ticket that has failed to pay out, most dogs who don't make the grade are discarded. The industry itself has admitted to killing up to 17,000 healthy dogs each year — 7,000 pups and young dogs never even make it to the track, and thousands of dogs 'retired' from racing will die — simply because they are too slow to win. The greyhounds who do make it to the track are put at significant risk of sustaining serious injuries, such as broken hocks or legs, or head trauma, during training and racing. Up to 200 dogs are reported injured during official races each week. Some even die from cardiac arrest due to the extreme physical intensity of racing. On many occasions the injuries are 'uneconomical' to treat and the owner will instead have the dog killed. On average around 5 dogs are killed at official races each week as a result of greyhound racing. Off the track their lives may not be much better — oftentimes being kept in tiny barren pens or kennels for the majority of their lives, only released to train or race. Racing greyhounds are not commonly kept as companion animals. Information from greyhound rescue groups also indicates that many rescued racing greyhounds have been underfed, possibly because they have been kept on a restricted diet to keep them at a lean racing weight. Once a racing greyhound is not fast enough to win races, his or her career soon comes to an end. Whilst a greyhound's natural lifespan would be 12 to 14 years, very few of these dogs will live to that age. The vast majority will be killed once they have served their (racing) purpose. Most dogs born into the greyhound racing industry will be killed before their 5th birthday. The Australian greyhound racing industry body, Greyhounds Australiasia, has admitted in a leaked internal memo that "this industry is responsible for the unnecessary deaths of anywhere between 13,000 and 17,000 healthy greyhounds a year." Some ex-racers go into breeding programs, but even they will then likely be killed at age 5-6 years. Other, perfectly healthy dogs are given to university veterinary faculties where they may be killed for use in teaching and training. Live baiting refers to the illegal practice of using live animals for the purpose of training greyhounds. Investigations by Animals Australia and Animal Liberation Queensland have revealed that live baiting is a routine and accepted training method used by dozens of Australian greyhound trainers. Investigators documented piglets, possums and rabbits being tied to lures and trainers releasing dogs to chase the lure then allowing dogs to catch and maul these defenceless animals. Trainers were also documented tying live animals to leads/leashes to taunt and stimulate greyhounds into aggressive behaviour before allowing them to maul the helpless animals. The groundbreaking investigations across New South Wales, Victoria and Queensland were aired on ABC Four Corners on 16 February 2015. As reported on ABC's 7.30, rumours of dogs being drugged with cocaine, caffeine and anabolic steroids have abounded within greyhound racing for years. In January 2015, WA trainer Linda Britton was suspended for 18 months after pleading guilty to doping dogs with anabolic steroids. Just days later, industry officials awarded her the title WA's No. 1 Trainer. The industry's Greyhound Adoption Program (GAP) operates in most states but rehomes only a relatively small number of ex-racing dogs — only 6% of all pre-raced and 'retired' greyhounds. The longest established GAP in Victoria rehomed 536 greyhounds in 2014, and the other states significantly fewer. Other rescue groups also rehome greyhounds, but together those efforts still amount to only 10% of dogs born the industry living out a natural lifespan. Families that have adopted greyhounds soon discover that these dogs are naturally gentle, loving and, surprisingly, don't need a lot of exercise. Find out more about how to adopt a greyhound here. UPDATE: As of July 2018, the Canidrome has officially closed its doors for the last time. Thanks to the dedication of thousands of people from all over the world — including caring supporters of Grey2K USA/Worldwide, Animal Liberation Queensland, Gone Are The Dogs, Friends of the Hound, Anima and Animals Australia — not one more greyhound will race and die at the cruel Canidrome! The Australian greyhound racing industry exports hundreds of greyhounds to supply and stimulate racing industries in other countries, where most of them will also be killed after their racing days. One of the biggest markets is Macau — where the Canidrome racing track does not allow any dogs to be adopted. Greyhounds Australasia (representing the State industry bodies) adopted a policy in 2014 opposing export of greyhounds to Macau, Vietnam and other countries which do not have animal welfare laws, and yet breeders/owners/trainers continue to export dogs to these countries. Australia is one of only eight countries in the world with a commercial greyhound racing industry — Australia is by far the biggest. However, internationally, it is an industry in decline. In the USA, greyhound racing is now illegal in 39 states, 28 of the 49 tracks have closed since 2001 and wagering has dramatically reduced. State governments provide millions of dollars to the greyhound racing industry — actively encouraging growth and participation through breeding incentives, appearance fees, infrastructure and race-day attraction grants and even prize money. Despite this extensive government support, the industry receives little, if any, government oversight. Australians spend more on gambling per capita than any other country. An estimated $4 billion is wagered on greyhound racing each year in Australia. A Productivity Commission review estimated the social cost of problem gambling to be at least $4.7 billion a year. A Price Waterhouse Coopers report in NSW in 2014 concluded that the racing industry is a 'consumptive sector', and doesn't 'generate any significant productivity benefits to the rest of the economy'. Animals Australia is opposed to greyhound racing as it places financial considerations ahead of the welfare of animals. Greyhounds in the racing industry are perceived as disposable goods and until greyhound racing is banned, these gentle dogs will continue to be confined in small pens, to suffer injuries, and to be neglected and killed. An end to industry self-regulation and therefore the establishment of a permanent Government 'Task Force' (in each State) that has regulatory oversight of greyhound racing. The introduction of statutory requirements to reduce breeding and to introduce effective programs to find homes for all healthy retired racing dogs. Programs which offer financial incentives to breed more dogs should be abolished. State governments to cease their funding of the greyhound industry. All lures used in greyhound training/racing to only be artificial material and without sound. All training/breaking-in premises to be licensed and have CCTV installed. As part of that licence — routine/random inspections of facilities can occur at any time without notice. State racing authorities to use their discretionary powers to immediately suspend any trainers and owners found to be live-baiting. The installation of straight tracks and the reduction of the number of dogs in each race to reduce the number of deaths and injuries to dogs. 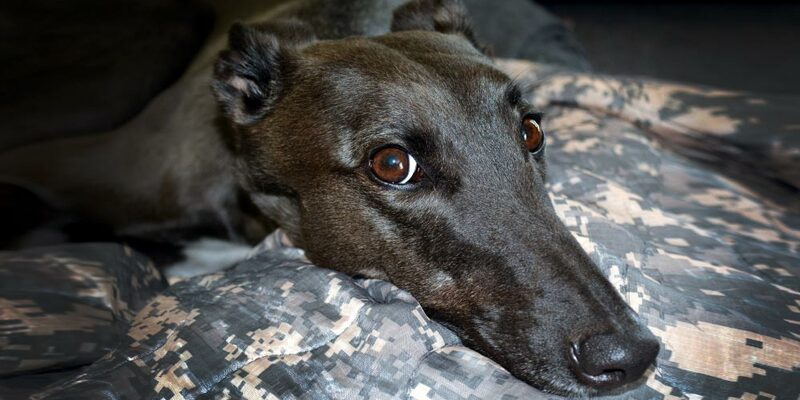 The Federal government to enact export laws to prohibit the export of greyhounds for racing. Never bet on greyhound racing. 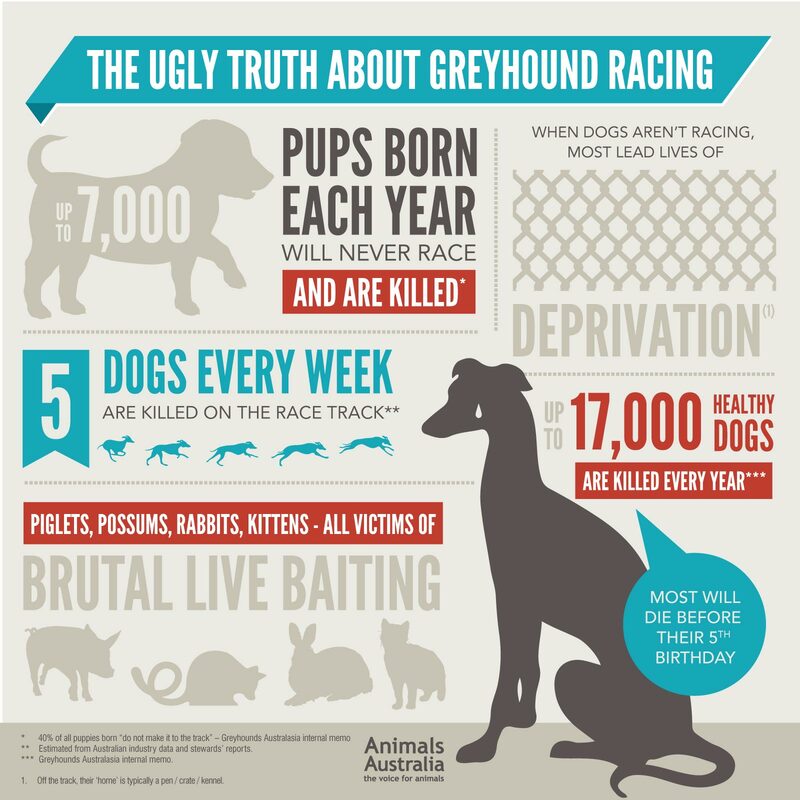 The Australian greyhound racing industry sadly puts profits above the wellbeing of the animals in their industry. Betting on greyhound races keeps this industry profitable. Take action to end barbaric 'live baiting' cruelty. Contrary to the general perception, greyhounds make great additions to the family. They love human company and their gentle nature and low requirement for exercise makes them suitable for almost every home. Discover more about adopting or fostering a greyhound. Greyhound rescue: Your guide to fostering or adopting a greyhound!